Although Madrid is not located near the sea it still offers many different opportunities to spend your time outside in the open-air. Depending on the season the natural surroundings near Madrid offers people who like trekking, skiing, camping, rock climbing and mountain biking great conditions. The nearby lakes even offers the possibility to practise water sports like windsurfing, water skiing and jet skiing. Madrid also has a lot of nice parks and gardens where people can relax in the open air. The most popular park in Madrid is the Retiro park situated in the center of the town near the metro station El Retiro. This park was originally the garden of the Retiro Palace build for Philip IV in 1635. In the middle of the park, which also hosts the Crystal Palace, there is a small lake where you can go for a boat trip. In weekends the park is full of musicians, children and people jogging or skating as well as people just enjoying the weather. The Royal Palace Park is another park situated in the town center just next to the palace. This is a small park from the 19th century and is created by geometric flowerbeds. To the South of Madrid near the airport and the metro station Campo de las Naciones is situated the Juan Carlos I Park. There it is possible to go fishing or on a boat trip in the small river in the park. In Madrid there is also various artificial gardens and green houses open all year around. The green house in the old Atocha Trian Station or the Crystal Palace Arganzuela (metro Legazpi) with its more than 8400m2 of exotic gardens are two examples. In the Biology Park (metro Valdebernardo) you can find 8 different eco systems and more than 3500 animals and the Royal Botanic Gardens (metro Atocha) is full of flowers from all over the world. For people interested in doing a nice bargain there is the street/ flea market El Rastro located near the metro La Latina. 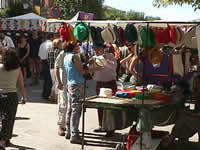 This major street market is open every Sunday from 9.00-16.00 and has more than 1000 stands. There you can buy everything from clothes and shoes, to paintings, old furniture or electronics and it is also a popular area to have lunch on Sundays.